If you missed the 1980s, it's difficult to explain just how important ninjas were to the pop culture of the decade. The global zeitgeist was transfixed by Japan's mythical shadow warriors, and stealthy assassins appeared in everything, from movies to breakfast cereals to mutated amphibians. Video games were no exception, but few captured the essence of what made ninjas so popular as did Capcom's Strider, which allowed players to climb walls, flip around like acrobatic lemurs and slice through enemies as fast as their greasy digits could mash arcade cabinet's attack button. Now, after 25 years of relative obscurity, Strider has returned. The ninja's latest mission features modern flair and a new world to explore, but at its core Strider is recognizable thanks to intuitive controls, an immediately responsive main character and reflex-dependent stage design. It may not be perfect, and most of the novel ideas in Strider can be traced to earlier games, but the end result is an engrossing adventure that cleverly blends the old with the new. Strider drops players into the boots of Strider Hiryu, a young ninja who has been sent to dismantle the empire of the evil Grandmaster Meio. That's the same plot presented in the original Strider, but calling this new Strider a remake ignores the drastic changes Double Helix has applied to Capcom's gameplay formula. In place of the original Strider's relatively brief quintet of stages, Double Helix's effort offers a single, massive map not unlike the twisting corridors, tunnels and subterranean hangars that made up 2009's Shadow Complex. This map depicts the fictional Soviet city of Kazakh, though that idea only serves as a backstory for each area's varying graphical design. In truth, the giant map contains a plethora of gameplay nods to the old Strider while also forcing players to make efficient use of the new abilities our hero discovers. For instance, one section, supposedly a neon-lit slum, contains a labyrinth of yellow spikes, conveyer belts, ponderously slow moving platforms, electric fences and wall-mounted turrets. 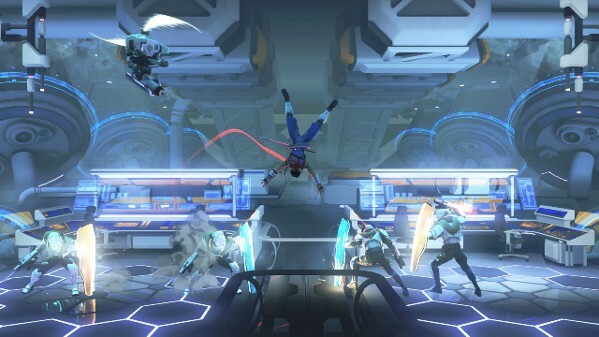 Careful use of the double jump ability and Strider's trademark skill at climbing walls will see you through, while demonstrating Strider's focus on action set pieces – a design choice that is a fitting homage to the series' roots and an enjoyable contrast to Strider's exploratory moments. Another section eschews gravity, leaving Strider to be pulled into and out of the orbit of several floating, magnetic balls. Maneuvering through this section under enemy fire is both intense and novel, but when you're forced to fight a boss under those conditions the design becomes inspired. It's a testament to how solid the controls are that players will be thrown off for only a few moments by something as jarring as a reversal of gravity. As a video game hero, Strider comes equipped with his own bag of tricks, though unlike the arcade original, this latest Strider forces players to hunt down each ability. Some of these upgrades are typical of the genre. There's a double jump, various items that extend Strider's health and energy bars and special weapon augmentations that allow Strider's attacks to open specific pathways. More intriguing are Strider's unique abilities. Reflecting enemy fire back into your foes with a flick of Strider's sword is very satisfying, though not as spectacular as summoning a bird made of fire to cut a burning swath through the screen. The wisest choice Double Helix made in designing this Strider pseudo-remake was staunchly adhering to late-80s arcade game rules. Not only are enemies color-coded to determine their relative difficulty and which weapons are best suited to snuff them out, but everything Strider fights will also stick to a pattern that can be easily exploited. This is especially true for later boss encounters, in which Strider will be nearly unable to damage his enemies without relying on pattern recognition and quick reflexes. This loyalty to the old-school could be seen as derivative, but Double Helix handles its homages with a deft touch, including only those that also benefit Strider's gameplay. That said, it's helpful that the developer has enhanced each of Strider's referential concepts. Take Strider's length, for example. The original Strider was designed as an arcade game, and as a result it can be completed in less than an hour. This new Strider is much longer than its predecessor. Not only is the main story longer, but once you've finished Strider, there are a huge number of collectibles to find, many of which require strategic use of multiple abilities to suss out. From bits of information on the game's enemies to new costumes for Strider, each of these collectibles unlocks a new piece of content. Most valuable are the game's Challenge Modes. A typical example drops players into a small room with waves of enemies periodically popping in. Strider must dispatch all of these foes before the time limit runs out, and doing so as quickly as possible is key to attaining a score worthy of a spot on Strider's online leaderboards. You can't have a proper Strider game without spectacular bosses, and in that regard this latest version does not disappoint. Ouroboros, the cybernetic snake boss of the original, returns, even larger than before. Strider again must clamber around his body during the fight, but now Ouroboros takes to the sky, forcing players to deal with strong wind gusts while also dodging periodic laser blasts. Later boss fights include a trio of Chinese sisters who are equally as agile as Strider himself, and a bounty hunter with a jetpack who seems ripped directly from the notebook doodles of a 10-year-old trying to convey his personal notion of "awesome." Each of these foes requires new tactics, generally employing the most recent upgrade Strider discovered, though they become almost trivial once players learn to exploit their attack patterns. And therein lies a flaw that weighs down Strider as a whole: It's a bit too easy. Strider's copious nods to an earlier era of gaming are welcome from a nostalgic standpoint, but by tuning the difficulty of the platforming elements down to lend emphasis to exploration, the developers have rendered these once exciting concepts toothless. The only times I died while working my way through Strider's campaign were in moments where I'd do something clearly idiotic, and I never died in the same place twice. Compounding this problem are odd graphical issues. Though Strider is an attractive game, Double Helix seems to have gone overboard on reflections. This leads to weird glowing artifacts, floating around the screen and mirroring the main character's actions. Rounding out the technical issues are periodic instances where a cutscene will seemingly detach Strider from reality. His scarf will be visible as a glowing red trail somewhere on the screen, but he simply won't manifest until you figure out the exact button combination that pulls Strider out of his cutscene netherworld. Players will find the above issues unavoidable, but these minor problems are overcome by Strider's absorbing fusion of action and platforming, which is complemented by a solid, taut storyline and plenty of bonus elements. It would have been nice had Strider been a more difficult experience, but it more than makes up for its lack of arcade-style challenge with a rewarding focus on exploration. Long-forgotten franchises are rarely resurrected as successfully as Strider, and hopefully we won't have to wait a quarter of a century for the ninja's next adventure. This review is based on an Xbox One download Strider, provided by Capcom. Images: Capcom.